Starting a t-shirt business soon? That’s a great idea, but if you’re not careful when it comes to buying the supplies, you could end up squandering your capital on unimportant items while neglecting the vital items. That is why it’s essential to have a materials checklist. 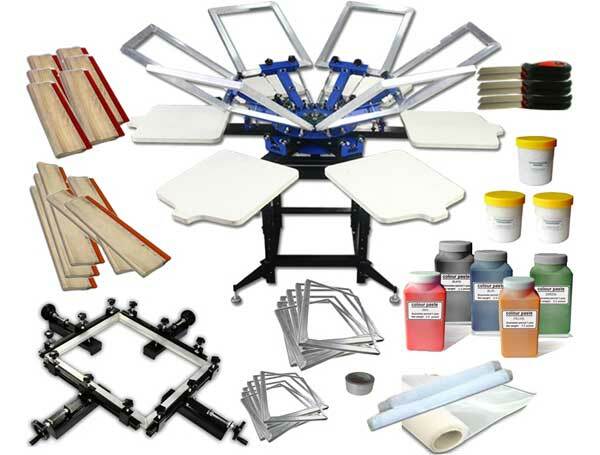 So, in this post, we will discuss the most important materials you need to buy for you to run a t-shirt printing business efficiently. If you’re getting into t-shirt printing, the first thing you need is a collection of artworks with which to attract customers. How to create artworks? You have two main options – you can either create them with your hands by drawing freely, or you can do it on your computer using software like Adobe Illustrator. Alternatively, you can purchase artwork or hire a seasoned designer. When coming up with designs, bear in mind the t-shirt’s material. For instance, if the t-shirt is textured, then a design with fine lines will not be very compatible with it. Now that you’re only getting started, you can just go for a manual press or even an iron box. Both will help you greatly when it comes to heat transfer printing, but a manual press will be more efficient than an iron. In the future or when you get more customers, you can then invest in an electronic heat press that is not only easier to operate but also faster. In fact, some swing-away heat presses can enable you to print mugs, caps, plates, and other items in addition to t-shirts. Oh, and by the way, if you feel confident enough and your budget allows, you can just invest in a commercial-grade heat press straight away. This is for those of you who will be doing digital heat transfers. With digital heat transfer, you’ll be printing on a transfer paper, then transferring the printed design to the garment using a combination of heat and pressure. Where does the inkjet printer come into play? The part where you need to print the transfer paper. But first, ensure the transfer paper you’re printing is an inkjet transfer paper. It is said that you can use any inkjet printer to print an inkjet transfer paper, but if you want excellent quality, you need to use a great inkjet printer you can afford. For the best results, we recommend you get an Epson printer and use it together with the RIP software. The RIP software is awesome, enabling you to produce outputs that are 100% opaque, but they’re a bit costly, typically going for between 400 and 1000 dollars. If you find that to be too expensive, you can go for the QTR, which is a cheaper version RIP software, and it’s also compatible with the Epson printer. Looking to go into screen printing? You will need a few screens. You’ll use these screens to make stencils, and through these stencils, you’ll transfer ink onto your garments, thus printing various designs on them. You can build some yourself, but the best thing would be to get screens from the store. If you decide to build your own screens, consider using aluminum to make the frame, as it’s more durable. Moreover, ensure the screens are big enough to accommodate your designs. The standard-detail screen has a mash count of around 110, but if you have very detailed designs, you should go for a higher mash count. Very important – you’ll be using a separate screen for each color you’re going to transfer so ensure you get enough screens. This is another item needed for screen printing. Emulsion is a liquid chemical that’s applied to the screens before they’re used. Realize that the screens are sensitive to light, and the liquid helps ease this sensitivity. You can either use a squeegee or a scoop coater to apply the liquid to the screens, so be sure to get either of these items. Which one is better? The scoop coater might be more efficient as it brings out better consistency in the distribution of the emulsion. While applying the emulsion, be sure o make it thick as this will provide more space for the ink and allow better transfers. After applying the emulsion on the screens, you will need a way to cure the liquid, and that’s where the exposure unit comes into play. By placing the screens in the exposure unit, you allow light to pass through them, and it’s this light that cures the liquid. For a start, a medium-sized exposure unit will be enough. Solvent ink is one of the most important t shirt design resources and fortunately, getting it is as easy as heading to Amazon and making an order. As you’ll be working with different clients who will need different designs, it’s important that you get as many colors as you need. You’ll use the quart container to mix the inks, and the scale will be for weighing the ink. After the exposure to light, both sides of the screen will need rinsing. This way, the emulsion that’s yet to cure will be safe from sunlight. The rinsing needs to happen in front of a washout booth. A conveyor dryer the gadget that helps you complete the last step in screen printing. With this machine, you’ll be able to cure the image and set it firmly in the fabric. There are just the chemicals you’ll use to remove the ink and clean screens. Before printing, you might need to block out parts of the screen or even seal the edges, and a tape gun will be very helpful in that. Sometimes the ink will be too thick. A curable reducer will come in handy for thinning it. Screens are reusable, but if it has emulsion, you’ll need to remove it first. These are available in all forms and sizes, and they’re vital for digital heat transfer printing. It is on these special papers that you’ll print the designs before transferring them to the fabric. 1. How do I print on a t-shirt using heat transfer? You can either use heat transfer vinyl (HTV) or a transfer paper. With HTV, you just cut out colored pieces of vinyl and use a heat press to stick them to the garment, but if you choose to use a transfer paper, you’ll need to print your design on the paper first. After printing the transfer paper, use a heat press to transfer the graphic to the t-shirt. A heat press can either be a machine or an iron, but the former will do a much better job. 2. What are the various methods of printing t shirts? 3. How can I make a t-shirt design? Making a t-shirt design is very easy. All you need is download the Adobe Illustrator or other editing software to your computer and use it to create custom t shirt designs. Alternatively, you can download designs from various stores or stock image sites like Pixabay. 4. Do I need a heat press for screen printing? No, there’s no need to add a heat press to your screen printing checklist, as this printing method doesn’t require heat and pressure. With these items in your checklist, you have a t shirt design kit complete package. The list includes both a screen printing checklist and the tools needed for heat transfer printing. It might seem like you’d drain your bank account just to get these items but here’s an idea that could be very helpful – go on Amazon and search for the items. Be sure to compare the prices of different sellers and don’t hesitate to buy from those offering a discount. And that’s it. We wish you all the best!